If you are looking for a sophisticated way to start a meal or add to the buffet at a cocktail party, baked brie is an excellent choice. Preparing and serving this elegant dish looks a lot more difficult than it really is to do. While baked brie looks and tastes like something that took a lot of effort, the fact is that it's one of the easiest appetizers to prepare. Remove the outer wrappings from the cheese. Cut the rind from the top of the wheel with a sharp knife. Place the cheese in a pie plate or oven proof serving dish. Spread the topping over the cheese to about 1/4 of the edge. Bake the brie for 12 to 15 minutes until heated all the way through. Carefully transfer to a serving dish or leave in the pan. Serve warm with the crackers and bread. This makes 12 appetizer-sized servings. If you have a little extra time, consider encasing the brie and your favorite topping in puff pastry. It adds both texture and beauty to the appetizer. Brie appetizers prepared this way are referred to as en "croute", which means "in a crust". While other crusts are sometimes used, puff pastry is the most popular option for brie. Thaw a sheet of frozen puff pastry dough. Roll out the puff pastry into a square that will fold over and completely seal the round of brie. Lay the puff pastry on a baking sheet. Spread the topping of your choice in a circle roughly the same size of your brie wheel. Place the wheel of brie on the topping, roughly centered. Fold the pastry up over the cheese. Gently squeeze together the pastry to seal. Turn the cheese wheel over so that the sealed edge is on the bottom. Brush beaten egg over the top of the pastry. Bake for 20 minutes, until the pastry is golden brown. Keep in mind that brie is a smooth and mild cheese that goes especially well with fruit. 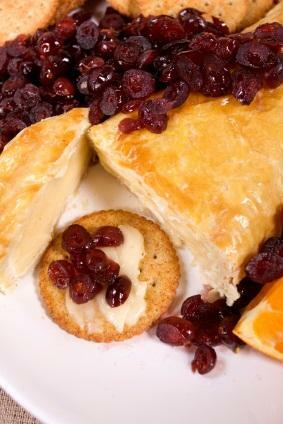 Cranberries are a classic topping for baked brie but there are many other possibilities. A classic for holiday entertaining, cranberries add tartness to the mild cheese. Combine the juice and sugar in a saucepan. Add the cranberries and rind. Cook until the berries pop and the mixture thickens, about 10 minutes. Makes about 2 cups of topping. This is a sweet and crunchy topping that is perfect for autumn entertaining. Toast the pecans in the oven. Mix the brown sugar and maple syrup. Mix well and use to top the brie. Makes enough to top one wheel of brie. This adds some spice to the mild cheese. It is excellent with toasted baguette slices. Spoon the jelly over the top of the brie. When brie is baked, it gets very creamy. To serve it you just need to allow it to cool a few minutes and place it on a serving tray with mild crackers, baguettes, or toast. It is a wonderful spread for sandwiches and wraps as well. Supply small knives to allow your guests to spread the cheese and topping on their crackers. Whatever you serve with the brie should be mild so that it doesn't overwhelm the delicate flavors of the brie. If there is any left, you can cover it with plastic wrap and store for up to a week in the refrigerator. You can serve the leftover brie appetizer warm or cold. If you have encased the brie in pastry, you may want to remove the pastry before storing it, as it will get soggy in the refrigerator. Keep in mind that you can easily put your baked brie together the day before and keep refrigerated until you are ready to bake it and serve it at your party. Since baked brie is such a popular food, you may want to make extra so that you can be sure that you don't run out.